The Decade Series will include one execution of each of Muska’s four Skytop silhouettes in a different limited colorway inspired by elements of Muska’s artwork and creative process with a focus on several key themes. The first release, “Layers,” features the original Skytop in a white printed leather execution with distressed colored accents which mimic a piece of Muska’s creative space that has been a constant throughout the last 10 years. 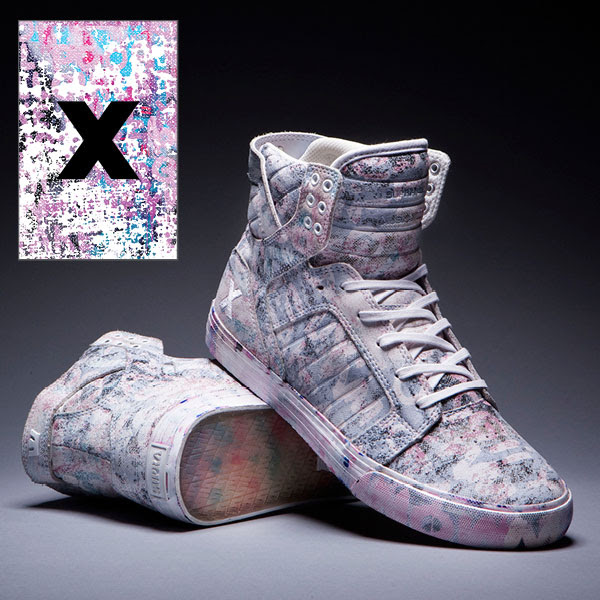 The Decade X Layers Skytop is constructed atop a vibrant pink sole with painted accents and matching foxing tape. The colorful sole and the cushioned EVA footbed have are marked with “Forever,” another detail from Muska’s garage wall painting while the quarter bears a tonal, stitched “X” as a nod to SUPRA’s 10th year.